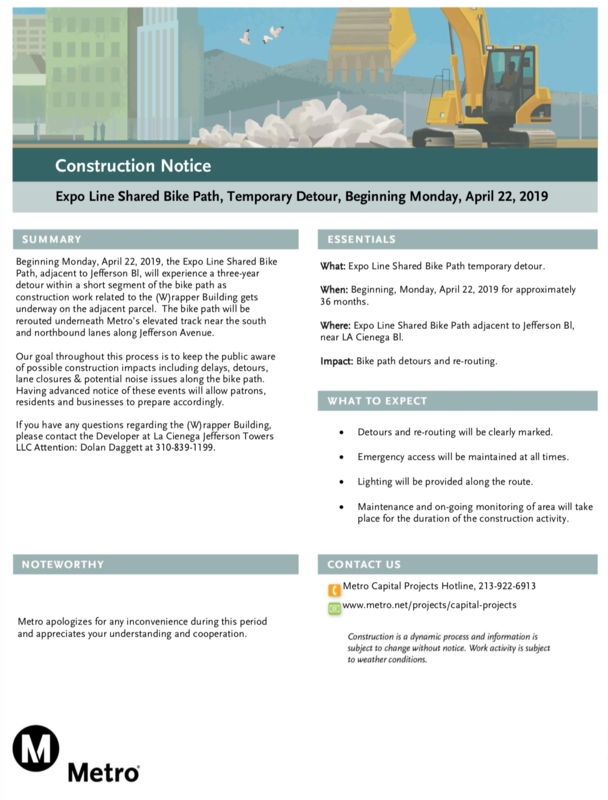 Beginning Monday, April 22, the Expo Line Shared Bike Path adjacent to Jefferson Boulevard will experience a three-year detour within a short segment of the bike path. During this time, construction work related to the (W)rapper Building will be underway on the adjacent parcel. The bike path will be rerouted underneath Metro’s elevated track near the north and southbound lanes along Jefferson Blvd. Small correction: It’s Jefferson Boulevard not Avenue. This detour is not going to be pretty, Are cyclist just going to have to rely on the sharrows on Jefferson? considering the traffic in that are it will likely be dangerous, What a bout the significant amount of pedestrian traffic which normally uses the path? Thanks for catching that, correction made. Very vague explanation of detour. Unclear if this means an off road option will be created or if cyclists will be forced to use the street. Zero sidewalks exist in the area and the sharrows on Jefferson make for a very uncomfortable ride due to uneven street width and high speeds in the area. Sad to see this along my commute. Agree that this is very vague, routing cyclists (and pedestrians) onto the street here puts them in a blind and fast corner. Why does the wrapper building get to close public property for three years? Ugh… along with the Expo station 7th St being closed for 90 days in June, and I use the Expo bike path to come back home in the evenings, my bike commute is looking hairy this summer.